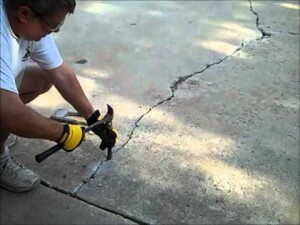 This is a brief article on how to fix Concrete Driveway Crack. If the ground under your concrete has a lot of movement then your concrete tends to crack. Sometimes this is impossible to fix this although it is quite hard to tell whether it is the ground moving or just bad concrete. Some other reasons why your concrete might have cracked is no steel layer in your concrete when it was installed, heavy construction with earth moving and ground compacting, if there has been some heavy construction in your area and they have been using industrial vibrating equipment to the point where you can feel the vibration this is most likely the cause for your cracking. There are a few ways to go about fixing your problem, I will explain the most efficient and easiest way i know. To fill the cracks I use a two-part epoxy resin; epoxy has a really good adhesive rating and is extremely strong though we will get to this part later. Step 1. Firstly you will have to examine the cracks. If they are quite wide and deep you have a serious problem, basically don’t waste your time they will probably re-crack a few weeks later. In this case contact a local contractor to seek advice on the matter. If the cracks are only surface cracks then you are good to go, keeping in mind there is never a guarantee the wont crack again. Step 2. You must cut the cracks open enough to be able the get the epoxy in, and usually about %75 of the way down into the slab. Average driveway and footpath slabs are about 100mm – 120mm though some footpaths might be less and some driveways may be more. To do this you should use an angle grinder with a diamond blade on it 4″ grinders are usually a bit small better with a 7″ or 9″. Be sure to wear all PPE as these tools are very dangerous. Step 3. Once you have cut the cracks open you must clean them out thoroughly. Use a pressure washer to blast them clean and it is a good idea to pour chlorine in the crack before pressure cleaning to kill any mould spores. After you have cleaned them properly leave them to dry completely (no moisture can be present when applying epoxy or it will not bond with the concrete properly). Step 4. Mix the epoxy with sand to stop shrinkage then use a trowel or paint scraper to push it into the cracks, leave it raised above the level of the concrete or it will shrink down and you will have to apply a second coat. Most epoxy will take at least 8 hours to dry unless you use a fast cure. Step 5. Use a 9″ grinder with a diamond cup wheel on it (a vacuum attachment is advised) and grind the epoxy flat level with the concrete and you are done. This will not look very appealing to the eye once it is finished, so a concrete resurfacing coating is advised. For more information on this please visit my website link located below.